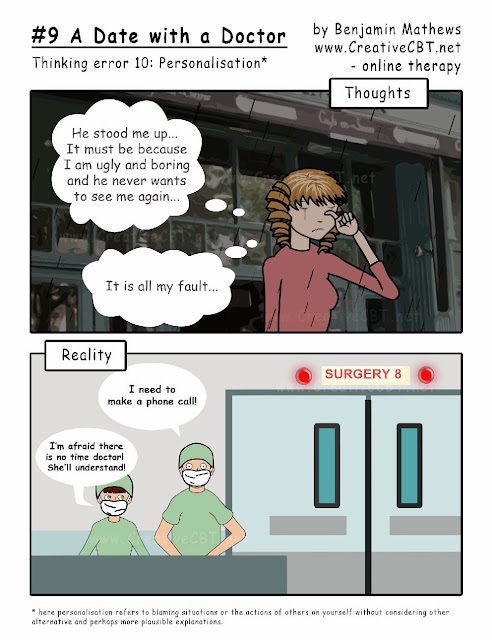 This comic is based off of Aaron Beck's thinking error #9: personalisation. Here personalisation refers to blaming ourselves for a situation or the behaviour of others. Personalisation becomes a thinking error when we fail to consider other alternative and perhaps more plausible explanations. Blaming ourselves by default only acts to prolong our negative affect. Furthermore, when using this type of reasoning, we may make the mistake of believing that we have confirmed our negative beliefs about ourselves. Do you tend to blame yourself for the way those around you act without considering alternative explanations?